Interesting topic. One that has got me thinking. Thanks for your time and patience, in writing this article. Sure thing, Greg. Thanks for your compliments. Great topic. You hit it on the nose with the boiler plate content. We have run into many clients that went with a industry specific service only to find out that they used the same content all over the country. Some spun and some just changed the business name and local modifiers. Another important question to ask is if there is a ‘no compete clause’ in your local area. 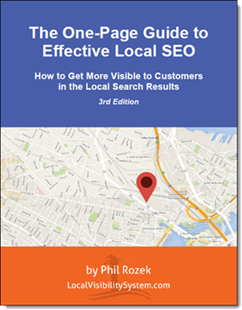 It is kind of scary if a industry specific local seo service takes on 2 or 3 clients competing for the same online space. I have seen it in a few places and it is in my opinion, unethical to have multiple clients competing against each other. If you are going with an industry specific service make sure your competition is not using him also. Hey Jeffrey, thanks for your compliments and for stopping by. Yeah, a no-compete clause is what I was referring to by “exclusivity policy” – but your word choice is better and more accurate. As you say, without that sort of policy there’s the potential for ugliness. It is so important that the marketer and the business are a good fit! That’s true enough, Jeffrey. But whether an industry-specialist understands “the ROI and conversions” any better than the next guy – or at all – is a big “if.” As I’m sure you gathered from the post, this isn’t a knock against industry-specialist SEOs. It’s just a kick in the pants for the business owner to ask questions – why the specialist specializes.